In the ongoing effort to eliminate paper, you iPhone’s Passbook steps in to provide electronic versions of boarding passes, movie tickets, coupons, and store cards. Tap Passbook on the Home screen. Tap Apps for Passbook at the bottom of the screen. 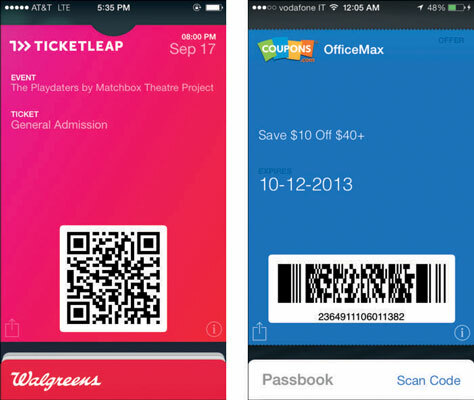 A list of apps that support Passbook appears. If you don’t see the Apps for Passbook button, tap Passbook at the bottom of the screen. 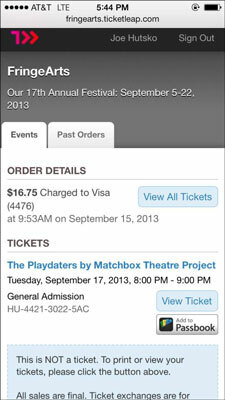 Tap the Free button next to the Passbook apps that interest you to install the app on your iPhone. Type in your Apple ID Password if requested. The app is downloaded and the button now reads Open. Tap Passbook and then tap the Scan Code button. The camera opens. Point it at the bar code on a product or a QR code in an ad to scan it; the pass or discount coupon is then added to passbook. You may receive e-mail with a link or find URLs on websites that download coupons (Coupons.com has many) or special offers to Passbook. Tap these links and the associated barcode or QR code is downloaded to Passbook. Tap the Add to Passbook button and then tap the Add button on the coupon or follow the onscreen instructions to insert your username or number and password. For boarding passes, proceed with online check-in and then tap Download Boarding Pass to Passbook option. After the passes are in Passbook, you need only tap the appropriate one and scan it at the check-in counter or cash register. This means all you need is your passport and iPhone at the airport and when you reach the cash register at your favorite store, instead of shuffling a deck of store cards, just tap Passbook and then tap the appropriate card. In no time, you’re on your way down the tarmac, points are added to your account, or discounts are applied to your purchase. Most of the passes in Passbook have options for automatic updates as well as some information about how the pass works. Tap the Information button in the lower right corner of the pass to see the “back side” of the pass. Go to Settings→Notification Center→Passbook to choose to see Passbook on the lock screen and the Notification Center. Then location and time based passes, such as boarding passes or theater tickets appear on the lock screen when you get to the airport or theater (as long as Location Services is on and you have a data connection). You can also eliminate a pass by tapping the Delete button in the upper left corner of the pass. Tap the Share button to send the pass to someone via AirDrop, Mail, or Messages.